See the featured projects and web-exclusive patterns from the Quilts and More Spring 2017 issue. The Spring 2017 issue of Quilts and More is on sale from January 17--April 24. The diagonal seams of the triangle-squares are oriented in random directions for a modern look. Utilize a whole bundle of fat eighths by sewing together rectangles of color. Use the remaining pieces to make a scrappy binding. Fashion a tote using your favorite print. Build blocks in three sizes to quickly finish a wall quilt. A mix of low-volume prints used in the background sets the stage for bold color. An all-time favorite color combo of cream, brown, and pink gives this Log Cabin quilt timeless appeal. Easy-to-piece blocks form the foundation for colorful fusible appliqué. Large blocks give a contemporary spin to a traditional design. Make a mini version of Modern Shoo Fly (previous slide) by Sharn Holland. Keep your eyes open for inspiration everywhere in the great outdoors. Try a new technique: Hand- or machine-outline-stitch details to fused appliqués using 28-weight black thread. 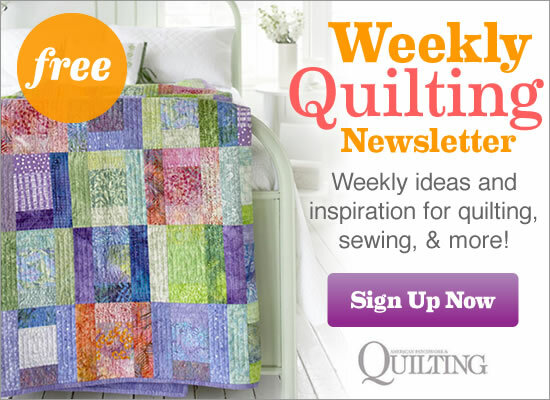 Snippets of antique fabrics produce a scrappy mini quilt that is easy to construct. Arrows point the way around this color wheel-inspired pillow.